Irish Ceramic Artist: Clay Sculpture: Biography, Works, Exhibitions. Specializing in abstract, organic forms, the Irish Ceramicist Jane Jermyn has shown her work throughout Europe and in many different parts of the world. A highly innovative clay sculptor in various styles, she is the author of an important paper on "Wet-fired Ceramics" which was published in 2001 in Ceramics Technical, the international Australian journal. Her ceramic art is represented in numerous sculpture collections around the world, including: the International Ceramic Studios, Kecskemet, Hungary; Hacettepe University, Ankara, Turkey; Collection of Contemporary Ceramics, Varazdin City Museum, Croatia; Collection of Museo del Fang, Marratxi, Mallorca; Tohisoo Manor House, Kohila, Estonia; Ceramic Museum, Boleslawiec, Poland; Municipal Collection of Camaguey City, Cuba; and International Museum of Ceramics, Fuping, China. See also Irish Sculpture. Born in Cork, one of six children, Jermyn grew up in Ireland and Canada. Although she had an early interest in pottery, family circumstances meant that a career in art was not feasible. In fact it wasn't until 1995, a quarter of a century and four children later, that she enrolled as a mature student at Grennan Mill Craft School ("the most stimulating year of my life"), after which she trained as a potter through the Crafts Council of Ireland Pottery Skills Course. Then, in June 1998, after a spell as Technician in the Craft School, she held her first solo exhibition. Later that year she began a Diploma course in ceramics in Carmarthenshire College of Technology and Art, where she received a Distinction for building a gas-fired soda-glazing kiln, and went on to receive a 2.1 Honours Degree from the University of Wales. Her sculpture was selected for Setting Out 2002, the annual exhibition of UK based ceramic graduates: the first of a number of invitations which have taken Jermyn all over the world. After working trips to Australia, and also Hungary, she was invited to be a guest Demonstrator at the Aberystwyth International Ceramic Festival (July 2003) before participating in the International Applied Ceramics Symposium, Avanos, Turkey, and the Ceramica Multiplex exhibition in Croatia. 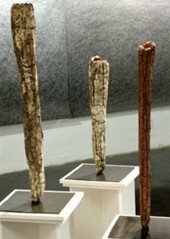 In June 2006, she took up a residency at Cill Rialaig Artists Retreat, Co Kerry, Ireland, followed by invitations to the 6th International Wood-fired Ceramics Symposium, Kohila, Estonia, and the 5th International Symposium of Art Ceramics, Camaguey, in Cuba. In March 2007, she showed her works at the Ballade Irlandais exhibition at the Galerie Embargo, Paris, and had a piece selected for 27th Concurs Internacional de Ceramica at Alcora in Spain. Later in 2007, she was invited to take part in 43rd International Ceramic and Sculpture Workshop and Symposium, Boleslawiec, in Poland, and her sculpture was selected for the Irish Crafts Council Stand at SOFA, the Applied Art Fair in Chicago, and at the ICMEA Emerging Artists Exhibition in Fuping, China. In 2008, she has already showed at the 44th Ceramic show in Boleslawiec, Poland, and at 'Images of Longing' in the National Craft Gallery, Kilkenny, and has been reselected to take part in SOFA, Chicago. Jermyn is also active in Ireland, having worked alongside several other artists like Gerda Teljeur, (drawings) and Juliana Walters (video). Her recent showings have been at Wexford Arts Centre (Spring 2007), The Broadstone Gallery Dublin (December 2007) and The Source Arts Centre, Thurles, Co. Tipperary (June/July 2008). She is a committee member of Ceramics Ireland, a member of the National Sculpture Factory, as well as Irish Contemporary Ceramics and a Registered Practitioner with the Crafts Council of Ireland. If the above list of achievements and activities have been fuelled by her realization that one's time is finite ("starting a new career at 44 means you don't have time to mess about"), she retains an amazingly youthful desire for innovation, as well as a strong affinity for sculpting in clay ("I've always loved it as a material"), not least because of its age-old pedigree. And although I'm sure she gathers ideas from wherever she travels and works, her greatest inspiration comes from the natural forms of trees, as well as geological formations, strata and texture. 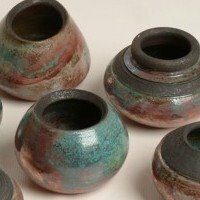 She is a master of several ceramic processes, including her own unique "Wet-fired" process, and a tireless experimenter with different methods of shaping, glazing and firing ("I must be a secret pyromaniac"). But while innovation and spontaneity are important to her ("the end result depends on the "serendipity" of the combination of clay, oxides and the firing process") Jermyn retains a strong respect for the tools, skills, techniques and traditions of her craft, which - as she says - "are the wellsprings from which ideas flow". Her work continues to attract attention from curators and critics alike. "Jermyn makes beautifully judged organic forms......there is something elemental and fundamental about her pieces... She is exceptionally attentive to nuances of tone, colour and texture as well as shape and seems to have an unerring instinct for sculptural form." Noted for her outstanding ceramic sculptures, Jermyn also produces a diverse range of decorative earthenware and stoneware.  For Irish ceramicists, see: Ayelet Lalor (figurative), Sara Roberts (wall hangings), David Seeger (abstract).  For more information about contemporary ceramics, see: Homepage.